The optics and display industry places a huge value on cleanliness. The human eye can quickly see any discoloration, changes in coating thickness, particles under a coating on the surface causing a spot defect, and generally most any imperfections of a lens. As a result, the optics industry must produce consistent surfaces on a lens, which require highly consistent manufacturing processes. As is common in most manufacturing, there is an interest in using a dry process to clean the lens, to eliminate messy water. Water can be an issue for the polycarbonate lens, as it is absorbed into the plastic and must be baked out, or problems will occur with coating. Cool Clean’s Omega™ CO2 cleaning systems provide water-free, dry cleaning of lenses before coating. These systems can be automated for particle removal of light dust and fingerprints; resulting in faster and more efficient cleaning as compared to water. Manufacturers of lenses for microscopes, eye-wear, telescopes, and rifles scopes are moving to this new innovative process for cleaning light oils and debris. 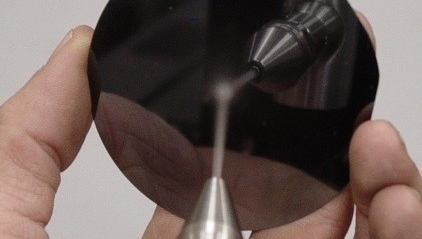 By using a nonabrasive dry CO2 spray, manufacturers can clean a lens without any human touching of the lens surface. Since the CO2 snow particles evaporate after coming in contact with the lens, it leaves the finished product dry and clean. Another benefit that our customers are noticing is the removal of fingerprints; which currently require manufacturers to use water or IPA. Optics Lens Cleaning: Particles of CO2 blast off the contaminants left from manufacturing, leaving behind no residue on the surface. After the CO2 has cleaned the lens, it can be moved straight to coating. Automated processes can be programmable to increase speed and position the alignment of the spray to maximize cleaning.